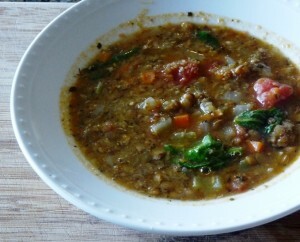 Here is a hearty Lentil Soup to warm the bones through the last scraps of winter. I have tried many lentil soup recipes but they either had an off taste or they lacked flavour. I hope this soup is to your liking. When ever possible I like to add a little history with a recipe. It makes for an interesting conversation starter at the dinner table. A member of the legume family, the lentil in addition to providing a rich source of iron is packed with fiber, folate and B vitamins. The lentil is often associated with Middle Eastern fare; however, the origins of this tiny legume dates back to 9000 BC Asia. Traces of the lentil are evident in Greece where it was once considered a poor man’s food while in Egypt the lentil has been discovered amoung the belongings of the royal Egypian tombs. Lentils were also a staple in early settlements of Hungary, Britain, Switzerland, Africa, Peru and Eastern Indian civilizations. Lentils remain a popular source of protein for many cultures throughout the world. They cook quickly and do not require an overnight soaking like their cousins. Add 1/4 to 1/2 cup of lentils to any soup or stew. Mix cooked lentils with recipes like hamburgers, meatloaf and pasta dishes. In a large soup pot, heat the oil over medium heat. Add the sausage; crumbling as it cooks. Add the garlic, onions, carrots and celery and saute until tender. Stir in garlic, oregano, bay leaf, basil, lentils, broth and tomatoes. Bring to a boil. Reduce heat and simmer for at least 2 hours until thickened and the vegetables are soft. When ready to serve, stir in spinach and pepper; cook until wilted. Season with salt if needed. – Note that the chicken stock helps give the soup flavor. Do not use canned broth it is flavorless. Use a good quality chicken base or homemade stock. I like Better than Bullion. If using water you might need to adjust the spices adding some thyme, salt, rosemary and a tablespoons of vinegar (distilled, red or white). – For a vegan version of the soup omit the sausage and stock adding 1 tablespoon of vinegar.